All of our trees are grafted to Malling 7, semi-dwarf root stock and are container grown (which means few to no roots are lost when it’s transplanted). The trees range in size from 4′ tall to 6′ tall. Most are considered whips (no branches yet) or lightly branched (may have a few smaller branches). Most trees will begin producing their first apples in a year or two after delivery. In some cases, an apple could be produced in the first season! The apples produced by this tree are best harvested later in the season. In Northeastern Wisconsin, we wait until early October. 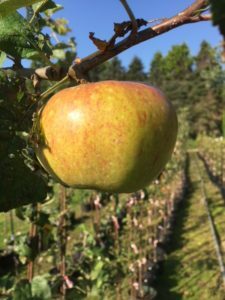 By that time, the apple will be at its best, very crunchy, sweet and tart. The apples can be eaten fresh, stored (never had enough to store, so I don’t know how long they would last), made into sauce,cookies or pies. Each tree comes with planting instructions and a registration card. The price for each tree is $55.00. Shipping will have to be quoted because of various distances and weight issues. Sales may also be restricted by the ship to state, such as CA, OR, HI. We are working with CA and OR to be able to ship these important trees to you. Call us or watch for updates! We do accept VISA and MasterCard. To order, please call our toll free line: 1-888-858-9927.